Gazpacho with Goat cheese and basil ice cream! Remove the skin of the tomatoes. Peel and seed the cucumber. Seed and slice the red pepper. Wash and slice the celery branches. Mix everything together. Add the lemon juice, olive oil, hot pepper, salt and pepper and mix again. Add the ice cube and place in the fridge. Serve really cold. Mix all the ingredients with a fork and place in your ice-cream maker. Place in the freezer for 2 hours before serving. 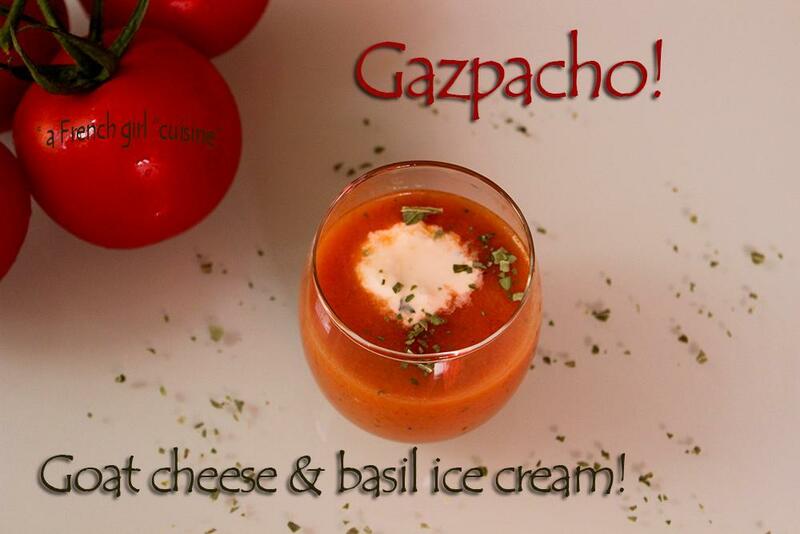 Place one ball of goat cheese ice cream in each gazpacho bowl! Lovely recipe. Never heard of Basil Ice Cream but I’d say it goes very well with the tomato gazpacho.